Attention to detail and design techniques help ensure bridges are constructed quickly and provide long life. 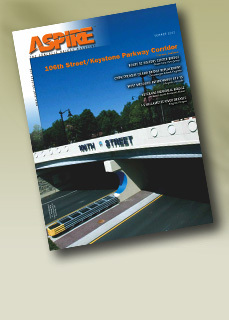 Curved, post-tensioned, spline bridge welcomes visitors. Environmentally sensitive asset alleviates seasonal demands. NDOT’s first bridge slide using accelerated bridge construction. The vital link for two cities: segmental bridge makes statement in Maine. Longest concrete arch spans in Oregon.